It’s hard coming back from vacation. And not just because we don’t want to go back to work. I actually love what I do, so I don’t mind when vacation is over and I have to get back to the shop. 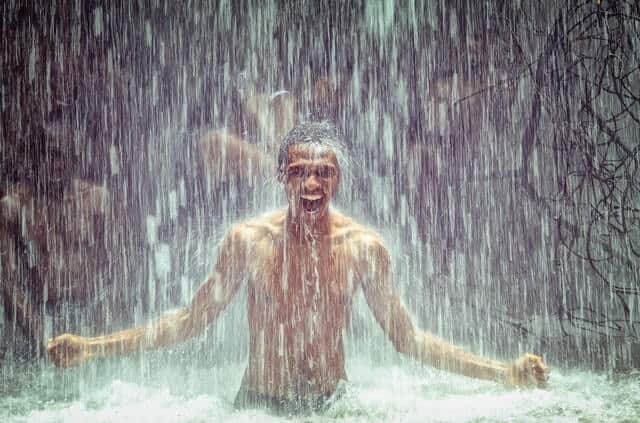 Coming back from vacation is hard because the hotels have the best showers! Now you can take that 5 star hotel feeling back home with one of the best handheld shower heads to really up your shower game. You’re doing all the grooming treatments to really look your best. 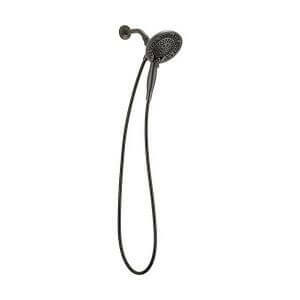 Now get yourself a massaging shower head that can be detached and really spoil yourself! Besides the luxurious feeling of using the best handheld shower heads, there are plenty of other benefits to using a shower head with handheld sprayer. We’ll get into that and more in a moment. 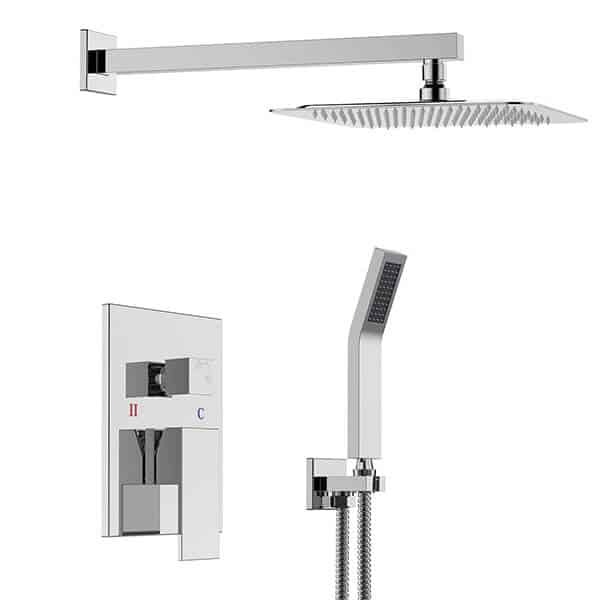 For now, take a look at our list of the best handheld shower heads in this handy comparison table below. If you have more time to read the in depth reviews, then keep scrolling and you can check out all the details about what I think are the best. If you’re already thinking about buying a handheld shower head then I probably don’t need to convince you now that it is a good call. What I feel like I should do, though is open up your eyes to some of the other uses you may not have thought about. If you have already read any of our reviews about pet grooming clippers, then your job was only half done. Get yourself one of these best handheld shower heads and you can make quick work of washing your pets for a doggy spa quality experience. Your dog deserves to be spoiled, but it isn’t just for his benefit. Your life is infinitely easier when you can cut down the time it takes to wash your pet. Think about how frustrating and time consuming it is to rinse your dog in the bath without a handheld. Pouring water on them with a bowl or bucket is not the best way to deal with a fussy dog. Not only that but you also don’t properly rinse and could be left with a soapy residue on their fur and skin. When you see ads for bubble baths for kids, it looks like a perfect way for parents and kids to bond. The reality is bathtime is sometimes the worst part of a parents day. Having a handheld shower head can take a lot of the headache out of the bathtime routine by getting the kids scrubbed down in no time. Not to mention those times when they come home from the park or sports practice and just need a quick rinse to get the dirt off. If your kids are like mine, then there is no way they are sitting under a running shower. Without a hand held, then there is no other way to get them to wash up aside from drawing a bath and washing them that way. Not exactly a quick way to rinse down. I actually have a Delta shower head and this is one of the best reasons to have it. Nobody has time to wash the tub everyday, but soap residue and other grime builds up. Then you end up needing some serious elbow grease to clean up your tub and shower to get rid of it. With the handheld, you simply rinse down the tub and shower door or curtain after every shower. You’d be amazed at just how easy it is to clean up the bathroom when you have one of these best handheld shower heads. What we do is to spray some leave on shower cleaner and let it sit for the day probably twice a week. Then before bed, we spray it down all over with the handheld. It makes it such a breeze t keep the soap scum from building up on the tub and shower doors. Getting to your nether regions when you have a regular shower that can’t be moved or adjusted ends up taking way longer than it should. When you can use a hose, then you can maneuver very easily and get where you need to without any fuss. I don’t think I need to paint a picture about how it is more fun to shower with somebody else. But, using a shower wand makes it much more practical so you don’t have to fumble with figuring out who gets water and when. An extendable hose for your shower gives you a lot of possibilities for play time with your favorite back washer. Since it takes less time to lather up and rinse off than when you use a traditional overhead shower, you end up spending less time in the shower. Which adds up to some serious water savings over time. 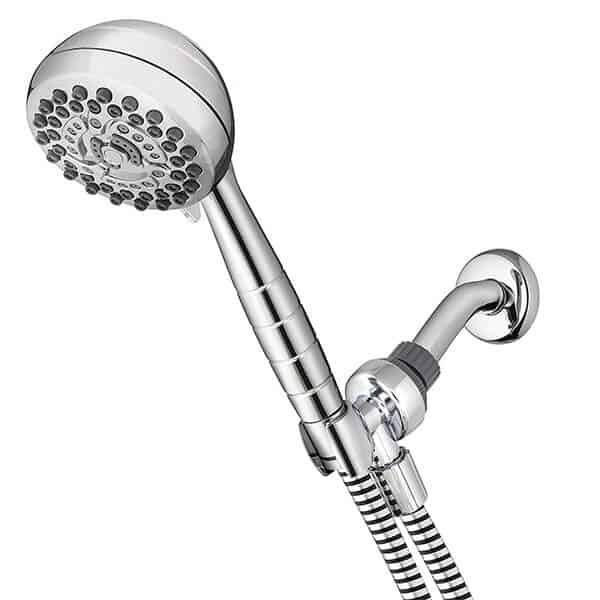 With the money you save on your water bill, the new shower head can end up paying for itself. When low pressure water in your home coincides with a low budget, then you’ll be happy to know you can still get a cheap handheld shower head that gives you a high water pressure experience. First item on the list of the best handheld shower heads was designed for those that have low pressure but still want a powerful water flow. If you have low water pressure, you can remove the flow restrictor in the head. This is there in case your home has high water pressure to regulate the flow, saving water. As far as settings go, it can do power rain, pulsating massage, power mist, rain massage, rain mist and water saving pause. Those are pretty much the settings you get when you go to a hotel and they have a spa style shower. The power rain setting is like a combination of a soaking rain to make you feel like you got caught in a deluge. Rain massage has the outside streams work like a normal rain setting with the inside that are the harder, wider massage jets. The only thing is that the head is only 3.5 inches wide, so the rain feature is not exactly the same as you would get with a higher end wide head. You’ll still get a nice downpour on your head and body, but it will be more concentrated than with the wider head handheld showers. Pulsating massage is as it sounds where the streams are intermittent. Power mist is a lighter style rain, but comes out pretty fast and hard, just the streams are very narrow. Rain mist, then is just like a light spring shower. If you like taking long relaxing showers but don’t like wasting water, then this gentle water flow is just right. Then the water saving pause mode is an on off switch so you don’t have to deal with an out of reach handle. Just press the button on the side of the head and pause the water while you move around. This is ideal for when you are washing a pet or child. The hose is five feet long and made of stainless steel. You pretty much get everything you need since there are no tools required. Installation only takes a few minutes and tightens up to make a leak free seal. Included is the white plumbers tape saving you a trip to the hardware store. To clean it, it has rub clean jets, which as the name implies is that you simply need to rub them to keep the water flowing. All this sounds too good to be true. Well, since the price is very low, they used chrome plates ABS which is a type of plastic. It is a durable plastic so it isn’t going to fall apart on you, but don’t expect it to last a lifetime unlike other best handheld shower heads that are priced higher. Another player in the high pressure department and considered one of the best handheld shower heads is this Waterpik 2.5 gallon per minute shower head. It boasts 2 times the power of its competitors. With seven different power settings, there is something for everybody. Power pulse massage gives a nice heavy stream that pulses to relax tired muscles. This gets the blood flowing into the muscles and helps them heal faster from a workout or just a busy day. And the warmth from the water will let them thaw out and relax. A perfect combination to totally relax and feel like you’re ready for another day. Full body spray is sort of like a rain feature, I’m just not sure why they didn’t call it that. Full spray is your standard stream and then there are power pulse settings for each of those. Eco spray is a mist spray to cut down on water and lastly there is a water saving trickle when you don’t need high power. Mineral deposits are easy to deal with in the nozzles as they are rub clean jets made out of silicone. Much like the Aquadance, it has a flow restrictor in case you already have high water pressure. If you have low pressure, leave it in to make sure you get the strong streams of water that you are no doubt looking for. The width of the head is 4.2 inches with a 5 foot long hose. Truth be told, the hose can be a bit frustrating as it is not as flexible as some others at the same price point. You can always buy another hose from Amazon.com and use the included one as back up. The bracket is adjustable to suit a variety of angles when the head is placed overhead. Installation is a breeze as it takes less than five minutes and requires no tools. Though you may want to use some white plumber’s tape that doesn’t come included. For the vertically challenged among us, putting the hand held sprayer head can be a pain. This one uses a Magnetix magnet to clip it onto the bracket so it is a literal snap to put it back. That’s just one of the convenient features of this head. The other thing that makes this stand out from other best handheld shower heads is the button on the handle to change the pressure settings. Now you can do it one handed since you don’t need to hold it with one hand and use the other to change the settings with a dial. If you are tired of chrome bathroom fixtures, then you will love the look of this wide head, brushed nickel removable shower head. Brushed nickel is not only just for aesthetics, it is also spot free which makes it easier to clean. There are 6 settings including a rain shower feature. The wide 5.5 head is ideal for that all over rain sensation as it completely soaks you. There is also a massage setting, an intensify, for a steady, concentrated stream, relaxing massage and wide spray. The hose is a very flexible, kink free one at 5 feet long. It is stainless steel, but not stiff at all so you are able to easily maneuver the head where you need it. I guess the one downside is that unless you remove the flow restrictor from inside, the pressure is not very high. Take that out if you need a boost of power and you will get it. With the restrictor it has a 2 gallon per minute flow and conserves water very well. Installation is easy and requires no tools. You may want to pick up some white plumber’s tape, however. There are few things more luxurious than a rain shower in your own bathroom. This one is the best among the best handheld shower heads since it is a flat and very wide head with an adjustable air inlet. This can make it even more natural feeling. The air injection not only makes it feel like a more realistic rain shower, but it also helps to conserve water. Some of the rain shower heads can really end up using tons of water, so it is a nice bonus to get one that is a water saver instead. The wall mounted overhead shower head is a 10 inch by 10 inch square, so it really does cover your whole body. The shower arm extends out almost 16 inches from the wall making it very comfortable to stand underneath the water without having to stand up against the wall. Aesthetically, it has a very modern look to it with a 10 layer chrome finish. Lots of straight lines and angles. It’s ideal for those with a sleek looking and contemporary design in the bathroom, but also looks very much in its place in a bathroom with a lot of natural rock and earthy colors. 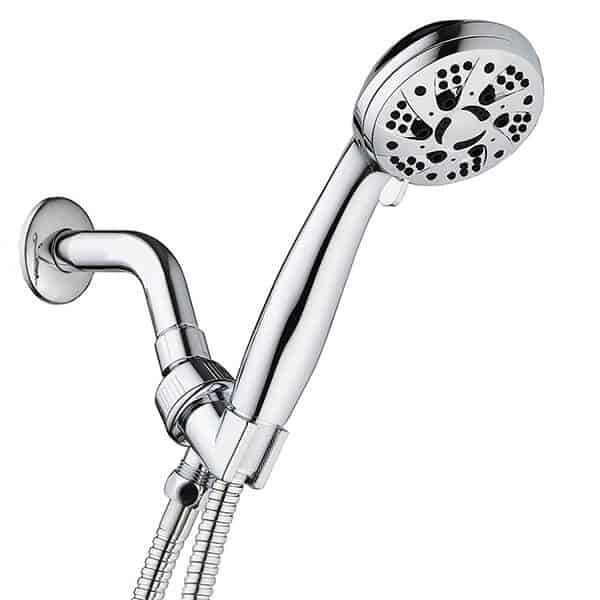 The hand held shower head is small and lightweight. The handle could be a little more comfortable and ergonomic, though. A downside to this unit is the fact that you can only use one head at a time. If you switch to the removable hand held head, the overhead wall mounted one turns off. You will need a plumber to install this. It is not like the other heads that just screw into the fitting. This needs to go behind the wall so you have to have a professional do it. Make sure you factor that into your budget when you are thinking about buying this. The hose is kink free and very flexible. It is almost six feet in length. There are not really any pressure settings as it is mainly supposed to be for rainfall. When you want to have an overhead shower that converts into a handheld, then it pays to have one that is embedded right into it. This is a great way to save space and to make sure your overhead shower is always right where you want it without needing to readjust every shower. 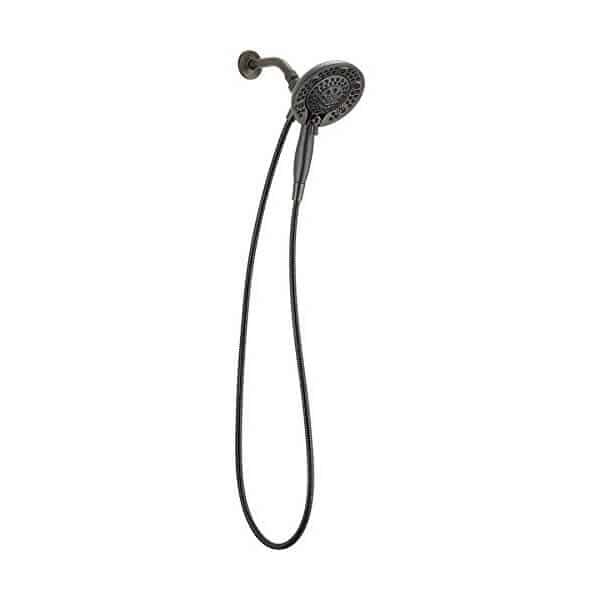 This stylish Venetian bronze handheld shower head by Delta is just the ticket. Unlike the Sunrise model I just featured, you can have both heads working at the same time. There are five different functions. Full Body, Fast Massage, Full Spray with Massage, Massaging and Slow Massage. The pressure you get from either head makes sure that the massage settings can ease those achy muscles by getting that pressure deep inside. It is really cool to be able to use the rain shower feature on both at the same time. The shower head is a respectable 5.9 inches when they are both together. There is a handy pause button that you simply press to shut off the water without needing to reach for one. You can save water this way while you are moving the head around. And when washing a pet or child, it comes in very handy to not spray the entire bathroom if you have to move with it while on. The rubber jets are made of silicone to easily remove any caked on mineral deposits. While there is an issue with the flexibility of the hose, it is very long at six feet. 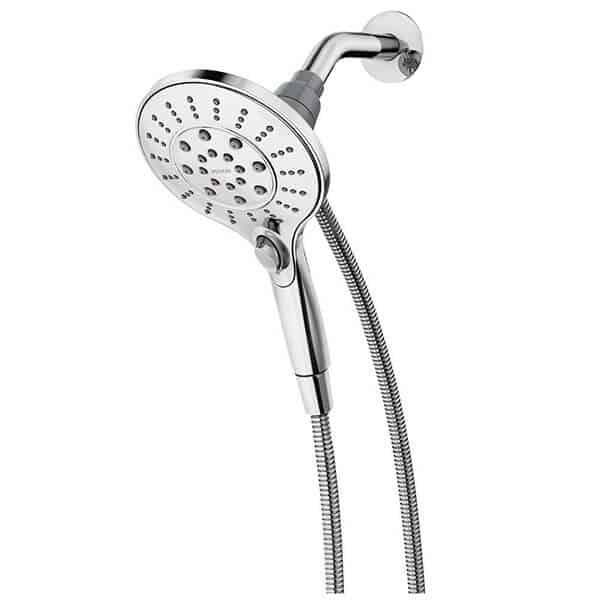 All in all, this is a well made and convenient shower head that gives you the options to customize your shower experience however you like, definitely one of the best handheld shower heads out there. Installation is very easy and does not require a plumber. Simply screw it into your existing shower pipe. Do ionic filtration shower heads really work? FULL DISCLOSURE: I am not a scientist! I am fairly certain that it is pseudoscience to suggest that negative ions can soften your water if you have hard or heavy water. And to think that the negative ions from water will somehow keep your skin more hydrated. I know that there is something to it when talking about hair dryers, but there is nothing to suggest that this is true for water. Softening the water is a chemical process that I doubt very much can be solved by simply using a special shower head. Could I be wrong about that? Until I read that there is evidence that it actually does work then I will go out on a limb and say that they don’t. It feels good to take care of yourself. To put on body lotion, groom your hair and nails and dress to suit your style and body type. Why not complete your grooming routine by using a spa style shower? 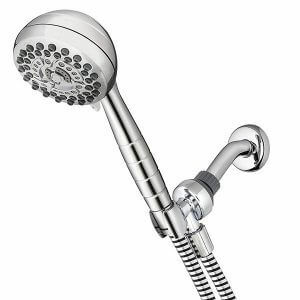 Make your ordinary shower luxurious with one of the best handheld shower heads I reviewed here today and make it a pleasure to take care of yourself. As I mentioned before, staying at a hotel makes you feel absolutely pampered. Why not go for the same thing at home? For not much money you can have a 5 star shower experience in your own shower!